Sharp MX-M3550 PCL6 Driver & Software for Windows 10, 8, 7, Xp (64-bit/32-bit) and Manual Installation- Sharp MX-M3550 is Sharp’s new mid-range monochrome (black and white) series. These models have the new type CR4 controller to unite all of Sharp’s mid-volume and multi-function printers with a common interface. Now, all the monochrome and full-color copiers have the same touch screen, and to make it simple they use the same accessory. The speed of print, copy, and scanning of this model is 35 pages per minute and up to 80 images per minute scanning. Hera are some innovative features from MX-M3550. There are the other features that you can get from Sharp MX-M3550. 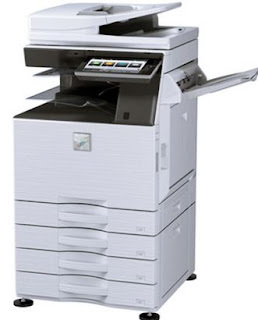 100 sheet reversing single-pass document feeder Duplex (2-sided) copying, printing, scanning, First copy out time is 4.5 seconds off of the glass, 7.4 seconds through the document feeder, 500GB hard disk drive, Account Control – Restrict users’ access to the machine, and give them allowances if necessary, Network Printing/Scanning10.1-inch touchscreen display with button customization and 256-bit of data encryption/overwrite is standard with an end-of-lease feature to wipe all personal data will really help you to do big office stuffs. This model also has wireless networking features. Using this feature you can print from or scan to cloud service such as google drive, Microsoft one drive for business, SharePoint online, etc. Easy to use the smart touchscreen functions. Tablet style menu provides quick access to function. This model has the best features. If you use this Sharp MX-M3550 model you won’t regret it. Because this model really helps you to make your job faster and do it effectively. Description: The innovative features from Sharp MX-M3550 that can make your work end faster.